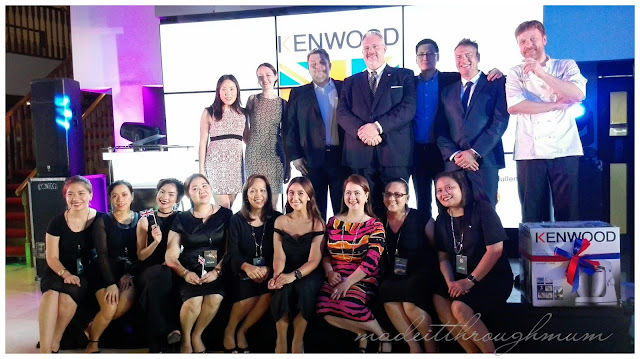 Iconic British Brand, Kenwood was launched in the Philippines last July 21, 2016 at the Residence of the British Ambassador to Manila, His Excellency, Ambassador Asif Ahmad in North Forbes Park. It aims to display the quality, strength and design of the award-winning products of Kenwood. Chef Martin John, Kenwood's development chef for the past 7years working closely with the new product with Great Britain's Ambassador Asif Ahmad #KenwoodPHLaunch. It was a fun and entertaining afternoon as guests were able to witness the food exhibit from the top culinary schools like Enderun, CCA, ISCAHM and Southville Foreign University. It was also a rare chance to catch the Ambassador do a live cooking demonstration plus the surprise stunt from the Mini Cooper X Kenwood collaboration. Would you believe that Kenwood mixer can pull a Mini Cooper? Watch this. Mini cooper packed with Kenwood executives over several feet was towed by a Kenwood Mixer. cool! Founded in 1947 by Kenneth Wood, this company has fast become a respected global leader in food preparation appliances, now trading in over 40 countries around the world. Kenwood products inspire confidence to create fantastic food for all occassions at all skill levels. The company joined the De'Longhi Group in 2001. All Kenwood products are built to stand the test of time. They select only the best materials to support amd enhance each product's role in the kitchen. They never compromise on the materials they use. They make performance and durability the cornerstone of each product. At Kenwood, they spent over 60 years dedicated to developing kitchen machines and appliances to improve food preparation in every kitchen. Their unparalleled experience ensures they have the technology, the skills, and the insight to genuinely innovate and bring completely new products to life. Everyone who uses Kenwood products in the kitchen feels confident to better prepare and cook food. That's because their products are engineered to be completely dependable, and designed to produce consistently high quality results with the greatest of ease. Are you Financially World Class?